Our Shay Locomotive and its history appear several times in our website depending on what aspect of the history we are attempting to tell. The same is true of the two inclines, El Portal/southside, and Incline/northside, so if you want more, do a search of the web site. Our Shay worked its whole real-work life at the top of the two inclines at El Portal and Incline. After that logging operation was shut down in 1942, the Shay was supposedly scrapped out of Stockton, CA but turned up later under a stack of tires and was put into service hauling tourists in Heber, UT. That’s all on this website elsewhere. This is the incline story in photos. 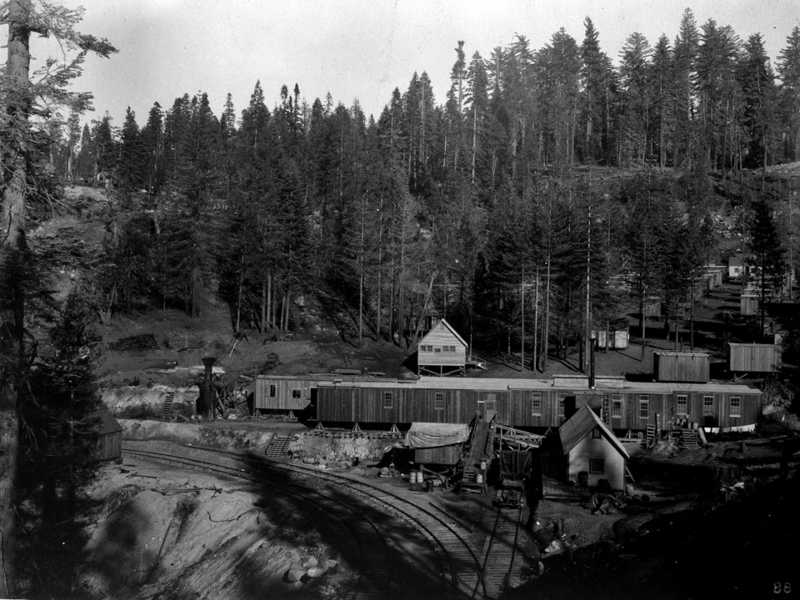 The museum’s Shay was part of the Yosemite Lumber Company and was first used to transport logs from where they were cut to an incline near El Portal where the logs were transported down the incline to a landing where they were loaded on trains belonging to the Yosemite Valley Railroad. 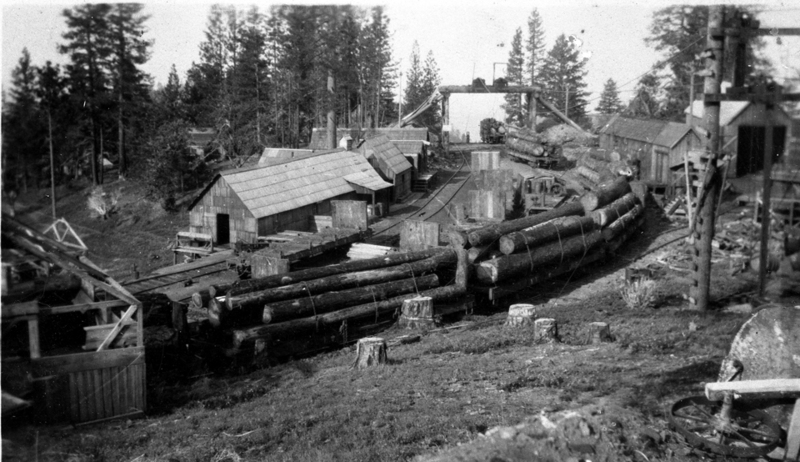 From there they were transported to a mill at Merced Falls where there was electricity generated that was used to power the mill.When the incline was moved across the river to Incline, our Shay moved over there also. Although we focus on the incline part of the operation, the operation out in the woods where the logs were cut and then brought by the Shays to the top of the incline was very difficult and dangerous also. There were trestles, steep grades, inclines and more. 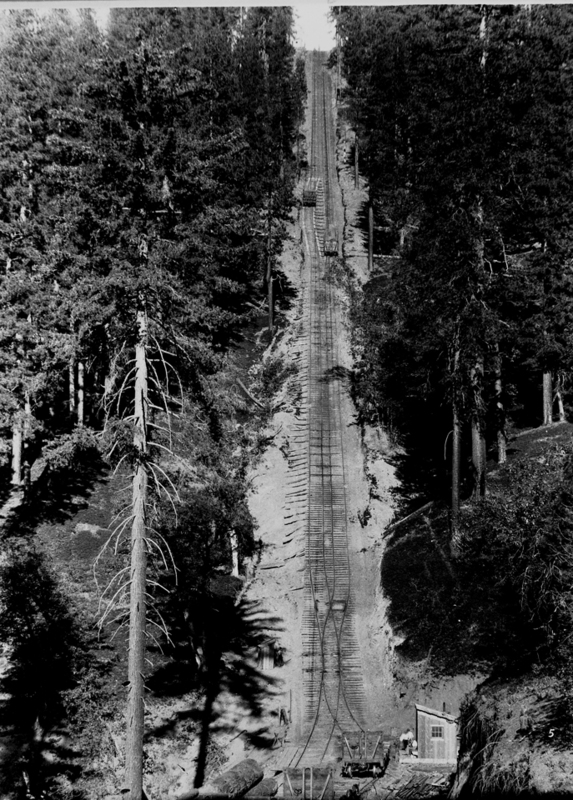 Bottom of the incline where the loaded log cars were transferred to the Yosemite Valley Railroad to be taken into Merced Falls to be milled on the electric powered saw mill there. This trestle was on the Yosemite Valley RR route and the locomotive seemingly watching the big mess is one of YVRR’s YV 2-6-0 locomotives. 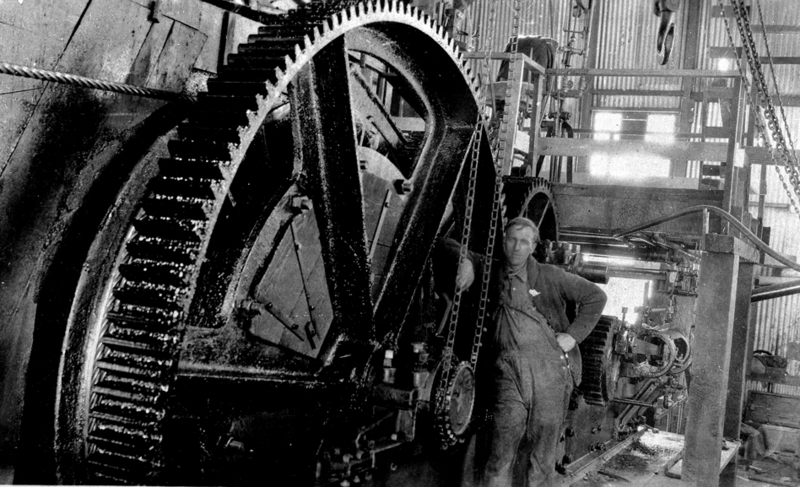 The photos that follow are from the collection of Leroy Radanovich, Mariposa Heritage Press, Mariposa, CA Leroy has a number of publications that he has done about the history of the Mariposa area. The Museum sells his book, Yosemite Valley Railroad which contains many photos that are of very high interest to train or logging buffs. The SNLM certainly thanks Leroy for his very unselfish donation to the museum. 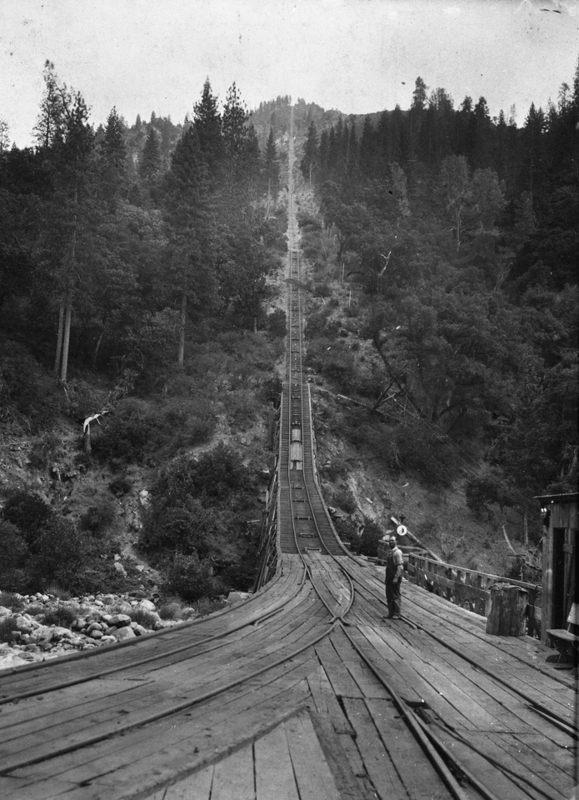 There are many good photos and a personal history of the incline in Jim Law’s Book, Memories of El Portal. Leroy is now the caretaker for the photos used in the book. This is the short 1600 foot incline out of Camp 1 on the Incline/northside operation. Had to have inclines to get logs to the incline. Wow! In order to build the inclines, in this case the northside one, they used small steam donkeys alongside the track to haul rails and such up to the workmen. 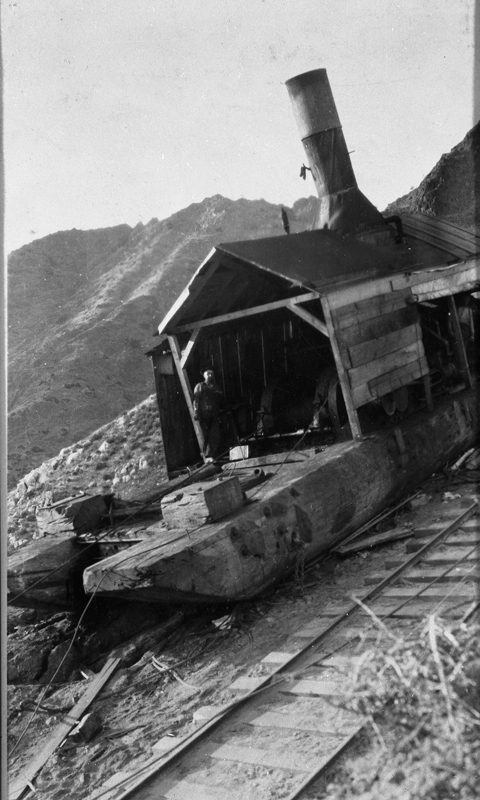 This 150 ton steam donkey at the top of the incline that lowered the loaded cars down, and brought the empty cars up had to handle around 9000 feet of cable and needed gears and spools this size. Line speed was 1300 feet/min which is amazing, and also tells us why the spools had to be such large diameter. The operation could get 6 cars per hour down the incline. The man standing here is Ray Eldridge, steam donkey engineer. This trestle is one of four used on the incline although it isn’t obvious looking up from the bottom. 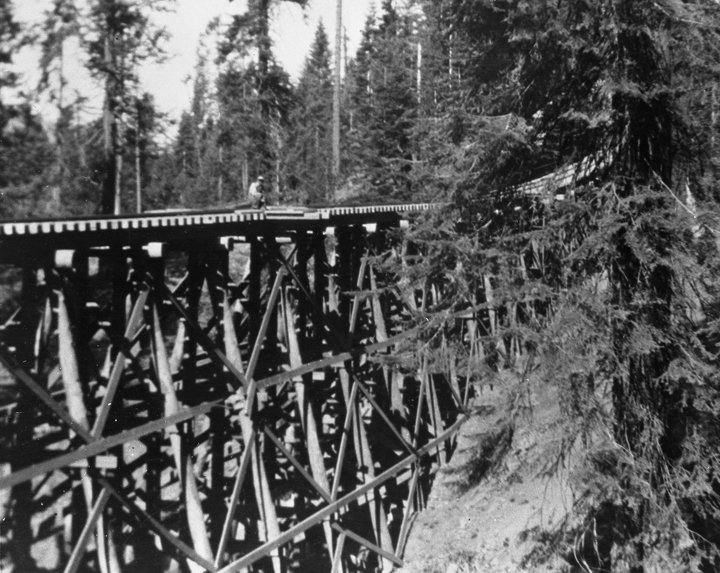 There were also trestles used in the rail lines that went back into the woods. The topography was pretty severe back there requiring trestles, another incline at one point, and the traction of the 4 Shays that worked up there. The editor knows that he said this in the photos at the start of this section, but he is mightily impressed at how hard all this was. The restraining cable, of course runs across this trestle, over rises, into dips, down about a mile and a half, and changing elevation by about 3000 feet. There were two overhead cable restraint structures. Loaded flat cars waiting at the top to be lowered down. 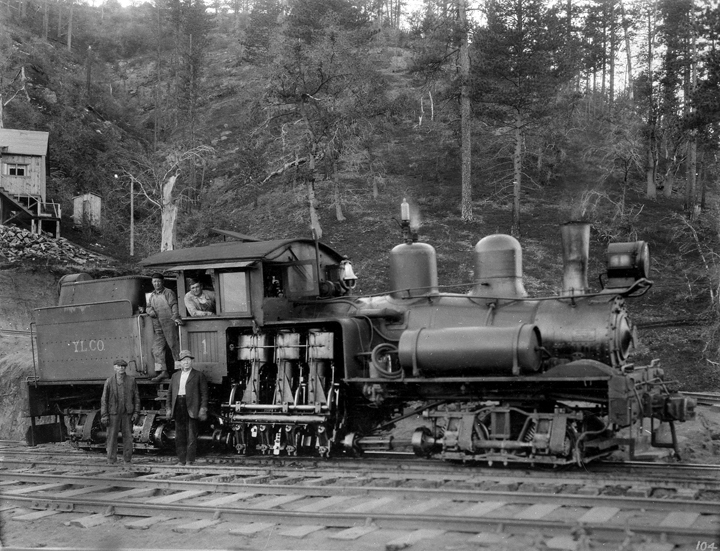 Shay #1, same configuration as our Shay, at the Yosemite Valley station at Incline. This Shay and ours worked their whole working life bringing logs to the top of the two inclines. Kind of like the website editor, our Shay is now enjoying a comfortable relaxed retirement. 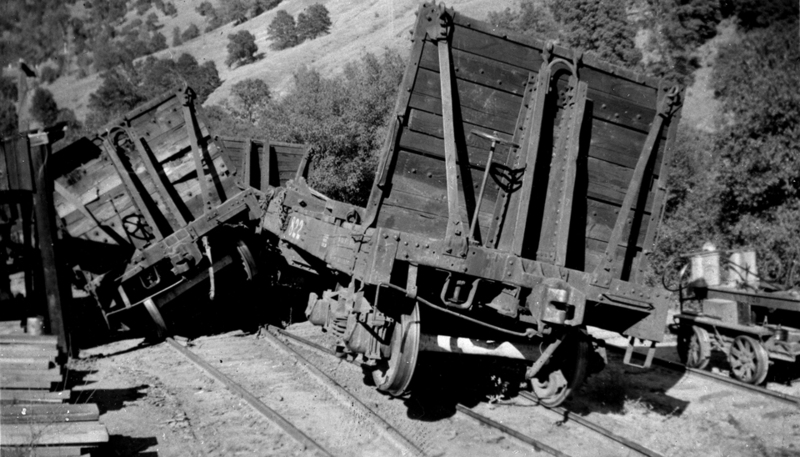 When the empty flat cars reached the top of the incline, they needed to have their brakes set as they were on a mild slope to allow them to be moved easily. At least one didn’t get its brake set and went clear to the bottom. Did someone get fired, probably so. Your editor wants to acknowledge the editing help he got in Dec. 2015, from Jack Burgess, author of the book, Yosemite Valley Railroads. He helped me identify which of the two inclines I should be using for the photo captions. I confess that rather than starting over again, I left the photos as they were and just identified which incline was being shown. Jack’s very fine book is unfortunately out of print and is not likely to be reprinted. A YVRR log car being loaded somewhere in the woods. YLCo Shay No. 2 with a train of loaded log cars. YLC Shay No. 1 near one of the camps.